In 1638 the Swedish government employed the experience Dutch explorer, Peter Minuit, to help them establish a colony in America. Soon afterwards two vessels owned by the Swedish West India Company arrived with 50 colonists and established a small settlement in Delaware Bay. They named the town Christina in honor of Sweden's young queen. The Swedes became involved in the fur and tobacco trades and this brought them into conflict with Dutch and English settlers. 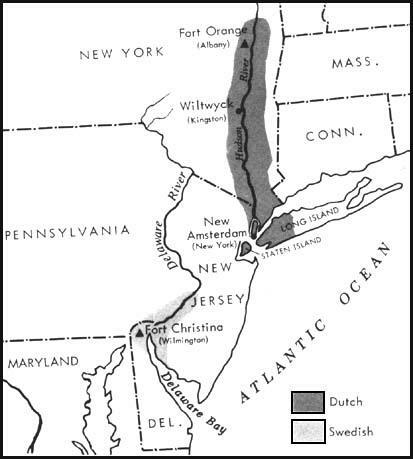 Peter Stuyvesant, the governor of the New Netherland colony arrived in 1655 with a formidable armada and took the Swedish settlement by force. It was not until the 19th century that Swedes began to think again about settling in America. In Sweden there had always been a shortage of good land to farm. It was estimated that over 40 per cent of Swedish soil was unproductive. This situation was made worse by an increase in population. One of the main reasons for this was a fall in infant mortality from 21% in 1750 to 15% in 1850. The situation grew worse in the 1850s when Sweden suffered a succession of poor harvests. Unemployment grew and wages fell. This led to a increase in the numbers of people wishing to emigrate. Most of these were bankrupted farmers and out of work agricultural labourers. Only about a quarter of all Swedish emigrants came from towns and cities. The first Swedish colony was established by Gustav Unonius in New Upsala, Wisconsin in 1841. The following year Peter Cassel founded New Sweden in Jefferson County. Within a few years there were over 500 Swedish immigrants living in this settlement. Other Swedish colonies were also formed in Swede Point, Iowa (1846) and Andover, Illinois (1849). Minnesota was another popular place to settle and there are over 400 place names of Scandinavian origin in the state. Organizations based in New York such as the American Emigrant Company and the Columbia Emigration Company, placed advertisements in newspapers encouraging people to settle in the United States. These companies bought and sold land and also arranged loans. Agents from these companies also visited Swedish villages and county fairs where they gave talk on the advantages of emigrating to the United States. Swedish immigrants often went to America in ships carrying cargoes of iron to New York. These ships provided cheap passage and would charge only about $12 per person for a trip that usually took about seven weeks. Swedish emigration to the United States was well organised. At New York Harbour the ship was likely to be met by a representative of the Bethel Ship Mission, an organization which helped arrange people to travel west. A report in the New York Times in July, 1851, described immigrants carrying Swedish and American flags, while marching in military fashion to the railroad station. In his book, Reminiscences: The Story of an Emigrant (1892), Hans Mattsontells how he travelled from New York to Buffalo by rail, took the lake boat to Toledo, where he caught a train to Chicago. After a short stay in the city he went by canal to LaSelle and then by wagon to Galesburg. Now out of money, Mattson worked as a railroad labourer for a $1 a day. After two years Mattson had saved enough money to buy land in Minnesota. Some of the emigrants found permanent work in the first city they arrived at. Others worked on the railroads until they had enough capital to purchase land close to the track. For example, large numbers of Swedish labourers helped build the Yellowstone division of the Northern Pacific and then became farmers in the area. Virtually all the Swedes who arrived in the United States were members of the Lutheran Church. Swedes were legally born into the State Church and could only leave it by taking formal action. It is therefore not surprising that early settlers in the United States soon began building Lutheran churches. Lars Paul Esbjorn, who arrived in 1841, started congregations in Illinois at Andover, Galesburg, Princeton and Moline. By 1858 the Swedish Lutheran Church had 13 ministers and 28 congregations. The most important religious figure was Tufve Nilsson Hasselquist. In 1855 he established the religious journal, Hemlandet. Four years later he founded the Swedish Publication Society in Chicago and supplied Lutheran churches with religious works and school textbooks in the Swedish language. Jons Jonsson, a Baptist who was in conflict with the Swedish Lutheran Church, decided to emigrate to America in 1865. He joined with other Swedish dissenters to establish a settlement in Crawford County. In 1872 this settlement was given the name Stockholm. The Swedish settlers tended to be very opposed to slavery and were strong supporters of the Republican Party. The Swedes religious leader, Tufve Nilsson Hasselquist, was active in the campaign against slavery and during the Civil War an estimated 4,000 Swedes fought in the Union Army. Hans Mattson had a successful career as a colonel in the Union Army and later became Secretary of State for Minnesota (1870-1872). A survey carried out in 1890 revealled that one in four Swedes in the United States were engaged in farming. It was estimated that by the 20th century they owned over 12,000,000 acres in the United States. This was a much higher figure that most other immigrant groups. However, large numbers lived in cities and by 1900 there were 150,000 first or second generation Swedes living in Chicago. This was a larger figure than any other town or city in Sweden except Stockholm. In 1890 there were large numbers of Swedish born immigrants in the states of Illinois (87,000) and Minnesota (100,000). There were also significant communities in Chicago (43,000) and Minneapolis (19,000). During the period 1820 and 1920 over 1,000,000 from Sweden emigrated to the United States. Only Germany (5,500,000), Ireland (4,400,000), Italy (4,190,000), Austria-Hungary (3,700,000), Russia (3,250,000) and England (2,500,000) had higher-rates of immigration. Swedish immigrants who made an important impact on America include John Ericsson, Birger Sandzen, Carl Eric Wickman, Greta Garbo, Ingrid Bergman, Swan Turnblad, Olof Krans and Nils Johansson. An investigation carried out in 1978 revealled that since 1820 over 1,272,000 people emigrated to the United States from Sweden. This amounted to 2.6 per cent of the total foreign immigration during this period. Dutch and Swedish settlements in 1655. We put our little emigrant trunk in father's old cart, and with many tears and the breaking of tender heart-strings we bade farewell to our brothers and sisters. Mother went with us as far as to the churchyard, so that we could say that she had followed us to the grave. When we were a little past the farm called Branslan, I turned to take a final look at our village, Norrback, and I felt as if my heart was being torn from my bosom. When we passed the dear old church, my soul was again stirred to its depths as I recalled that it was here I had been baptized and confirmed and had taken part in the worship, and now I would most likely never see it again. Looking back to those days, I see the little cabin, often with a sod roof, single room used for domestic purposes, sometimes crowded almost to suffocation by hospitable entertainments to newcomers; or the poor immigrant just landed from a steamer, in his short jacket and other outlandish costume, perhaps seated on a wooden box, with his wife and a large group of children around him, and wondering how he shall be able to raise enough means to get himself ten or twenty miles into the country. (3) A Swedish emigrant was shocked when he arrived at the home of relatives who were living 43 miles south-west of Milwaukee (1843). Their home was much poorer than any charcoal hut in Sweden, without floor, without roof, and with a few stones in a corner which were supposed to be a stove. Such was the magnificent house which they had written they were building to receive all the Swedes who would come. The Swedes are generally described as even-tempered, serious-minded individualists. They have a strong sense of property ownership and a deep religious sense. The Swedes are noted for their adaptability to American conditions, for their ability and willingness to work hard, and for their marvelous physical stamina. The percentage of home ownership is high among them. Swedes also have an unsurpassed devotion to education, and send their children to school; the rate of illiteracy among them is extremely low. Like other Scandinavians, the Swede has little difficulty in adjusting himself to the American democratic system of government, for he comes from a country in which he has already learned the technique of popular elections. The question whether immigration shall be encouraged or restricted, and whether naturalization shall be made more difficult or not, must be considered both from the political and from an industrial point of view; and in each case it is necessary to glance back and see what have been the character, the conduct, and the political leaning of the immigrant, and what he has done to develop and enrich our country. If we look at the political side first, and, as our space is limited, we will go back to 1860, calling attention, however, to the fact that up to that time, no matter from what cause, the immigration had been almost entirely to the Northern and free States, and not to the slave States. These, when carefully examined in connection with election returns, will show that but for the assistance of the immigrant the election of Abraham Lincoln as president of the United States would have been an impossibility, and the nineteenth century would never have seen the great free republic we see, and the shadow of millions of slaves would today darken and curse the continent. The Scandinavians have always, nearly to a man, voted the Republican ticket. The Germans, likewise, were nearly always Republicans. In fact, the States having either a large Scandinavian or a large German population have been distinguished as the banner Republican States. Notably is this true of Iowa, Wisconsin, Minnesota, and Michigan, which has a large Scandinavian population; and of Illinois, Ohio and Pennsylvania, which have a very large German population. Good and bad, the Scandinavians monopolize Minnesota politics. Of the last nine governors of the state, six have been Scandinavians. So is Dr. Shipstead, who defeated Senator Kellogg in the 1922 election; so is Harold Knutson, Republican whip of the House. Scandinavians make up a large proportion of the Minnesota state legislature, and while in Santa Fe the Mexican legislators speak Spanish, while in Quebec the representatives still debate in French, though for generations they have been citizens of a British dominion, in Minnesota the politicians who were born abroad are zealous to speak nothing but Americanese. (7) Glenn Seaborg wrote about his Swedish background in his autobiography, Life of Glen Seaborg (1982). Both of my parents were Swedish. My mother, Selma Olivia Erickson, was born in Grängesberg, in the southern Dalarna region of Sweden and came to the United States (Ishpeming) in 1904, when she was seventeen years old. My father, Herman Theodore Seaborg, was also born in Ishpeming. His parents came to Ishpeming in their youth and met and were married there. Ishpeming had typical sections that were nearly all Swedish and it was in one of these that we lived. Since my father was fluent in Swedish and this was my mother's native tongue, the Swedish language was spoken in my home as it was throughout this community. I learned to speak and understand Swedish before I did English, but I am afraid that in the intervening years my facility with the language has declined. Swedish customs of all kinds prevailed in our home. I remember particularly well the Swedish food that we enjoyed at our dinner on Julaften, or Christmas Eve. The fare usually included smörgåsbord, which featured sil, or pickled herring. One of the mainstays was lutfisk, which was always served with boiled potatoes and a white sauce. Another feature always was saffron buns and bread, usually served hot and made with glacéd fruits. This was part of a large spread of buns and cakes including gingersnaps made in the form of goblins, piglets, stars and other patterns. Another component which was almost always present was the Swedish lingonberries, which I still like so much. The meal was usually topped off with risgryn, or rice pudding, which was topped with cinnamon and cream and sugar.